When it launched, DJ Jigüe joined the state-run hip-hop label that was meant to lift up rappers in Cuba. But things didn’t go as planned. Photo by Janice Llamoca. Isnay Rodriguez quickly stood up on his feet. He was lost in his childhood memories of neighborhood b-boy battles back in his hometown of Santiago de Cuba. These were one of his earliest encounters with hip-hop. “Breakin’ and Breakin’ 2 used to play every summer. As soon as the movie finished, I swear to you, everyone would be on the streets,” he said, as he began to move his body almost as if he was going to burst into breakdance—right in the middle of his home studio in Central Havana. “YOUR KNEE,” his wife Ained cut in. Instantly, Rodriguez was sent back to reality. “I forgot,” he said with a sheepish smile. He sat back down and grabbed his crutches. The knee pain had been around for a few days, but for a second, it seemed that the dose of nostalgia provided a cure. Isnay Rodriguez is better known in Cuba as DJ Jigüe. 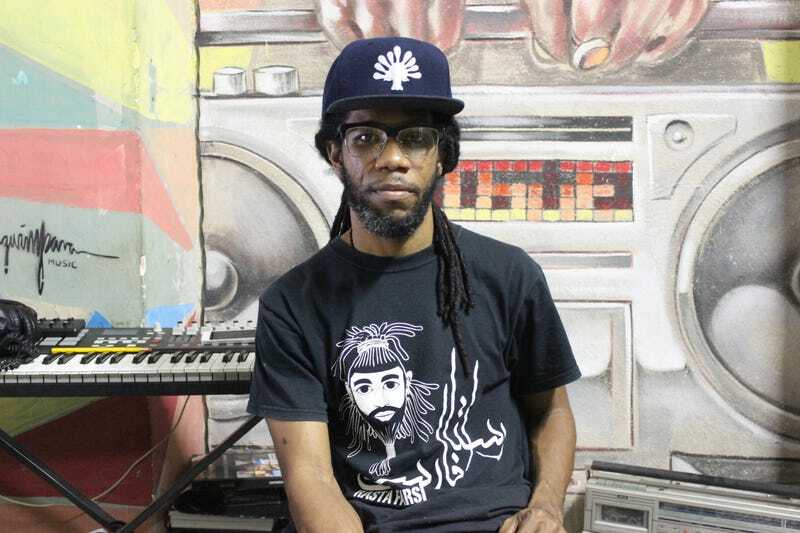 The 36-year-old is a producer, artist, and founder of Guámpara Records, a record label that he claims is the first independent urban music imprint. He’s also a self-taught hip-hop historian filled decades of research, thanks to an extensive archive of offline Wikipedia pages. “I knew more about American rap than Americans,” the Havana-based DJ boasted. It’s one thing to read about it, and it’s another thing to live it. Today in Havana, information is a tad more accessible with multiple public wi-fi hotspots spread throughout the city. However, cultural records of hip-hop in Cuba are not as accessible for those who didn’t experience it in the moment. Like any other genre, Cuban rap had its own beginnings and although it mirrored the rap that was born out of New York in the ‘80s, Cubans had their own set of battles to fight. Rodriguez was close to 13 when he saw his first rap video, Public Enemy’s 1989 single “Fight The Power,” on a neighbor’s imported VHS. It was 1993 and by then, the influence of American rap had begun trickling in. For Rodriguez and other Cuban emcees, it wasn’t until the rhymes of Puerto Rican rapper Vico C reached the island when everything clicked. It was rap and in their language, Spanish. By 1998, a direct connection to the U.S. emerged in Cuba, thanks to Nehanda Abiodun: a U.S. Black Liberation Army activist in political exile living in Havana. “Nehanda was a super important person that connected the Cuban hip-hop scene with the African American movement,” Rodriguez said. Because of her, the annual Black August Benefit Concert (funds went towards building hip-hop in Havana and an emergency fund for political prisoners in the U.S.) partnered with the festival and brought progressive American artists to Cuba. The revamped festival brought out America’s socially conscious class: Dead Prez, Black Thought, Common, Mos Def, and Talib Kweli. Despite Fidel Castro’s government watching, Cuban rappers found a way to distribute their music independently, even if they were banned from performing it and the music was not sold in stores. “Cuban rap was more conscious than American rap,” Rodriguez said. “El cubano cuando no llega, se pasa.” Loosely translated, the popular Cuban phrase means: When Cubans set out to do something, they don’t stop until they’ve gone above and beyond expectations. There’s a well-known (to Cubans anyway) tale about how rap gained importance in the eyes of the Cuban government. The story goes: When singer and actor Harry Belafonte was in Cuba for the Havana Film Festival in 1999, he attended a luncheon that Castro hosted after meeting with rappers who felt “frustrated and voiceless” in Cuba. Belafonte captured the attention of Abel Prieto, the Minister of Culture at the time, and he dropped a little knowledge about hip-hop culture. The cosign was all it took. In 2002, the Agencia Cubana de Rap was formed as a government entity to regulate hip-hop on the island. “So then there’s a meeting with the Minister of Culture and a group of the most important rappers and that’s where the idea is born: to create an agency so rappers could have a path to become professional artists,” Rodriguez said. In 2007, Rodriguez became the associate director of the agency. He no longer works there. The Agencia Cubana de Rap has produced a few albums since its inception, and most notably, published a magazine titled Movimiento, which highlighted the rap community in Cuba. For the rappers who have chosen to work with the agency, releasing music through them provides some sense of security, explained Rodriguez, adding that many people don’t want to leave to become independent artists. American hip-hop continues to be a heavy influence in Cuba today. When Drake and Rae Sremmurd do something stateside, by the time it reaches Havana, it’s “what the young people want to do,” according to Rodriguez. “There are a lot of people who are still maintaining [the socially conscious rap] spirit, not like before, but still. You can’t compare it. The ‘90s was the golden era of rap cubano,” Rodriguez said. The same sentiment is often expressed by old-school hip-hop heads in the U.S.
With the internet and how readily available it is on phones, it’s hard to imagine not being able to search for any song when it comes up in conversation, or stop everything and stream the latest Gucci Mane album when it drops. “The new generation in Cuba doesn’t have those luxuries,” he added. However, internet access on the island is growing, and even without it, a network of file-sharing that’s grown in Cuba means young people can hear the latest music as quickly as a few days after it drops. Janice Llamoca is a Peruvian-American journalist covering topics from culture to entertainment. She has written for various publications such as BET, LA Weekly, NPR’s Latino USA, Remezcla, and more.